The increasing number of immigrant students, English Language Learners, and students of color in U. S. schools present educators with both opportunities and challenges. How can educators help close the achievement gap by building upon the languages and other learning that occurs in the home and community cultures of students from diverse groups? This question guided the work of the LIFE Diversity Consensus Panel convened by the LIFE Center (The Learning in Informal and Formal Environments Center) and the Center for Multicultural Education. Learning In and Out of School in Diverse Environments is the product of a two-year project during which a panel convened by the LIFE Center (an NSF Science of Learning Center) and the Center for Multicultural Education identified important principles that educational practitioners, policy makers, and future researchers can use to build upon the learning that occurs in the homes and community cultures of students from diverse groups. It also contains a Checklist that educational practitioners can use as a tool to generate dialogue about the principles identified by the LIFE Diversity Consensus Panel. This publication also contains a helpful bibliography of new and informative resources. Copies of Learning In and Out of School in Diverse Environments are available from the Center for Multicultural Education. Price: 1 to 9 copies, $12.00 each; 10 or more copies, $10.00 each. Prices are inclusive of taxes and postage. Checks or purchase orders should be made to the University of Washington. Click here for order form. 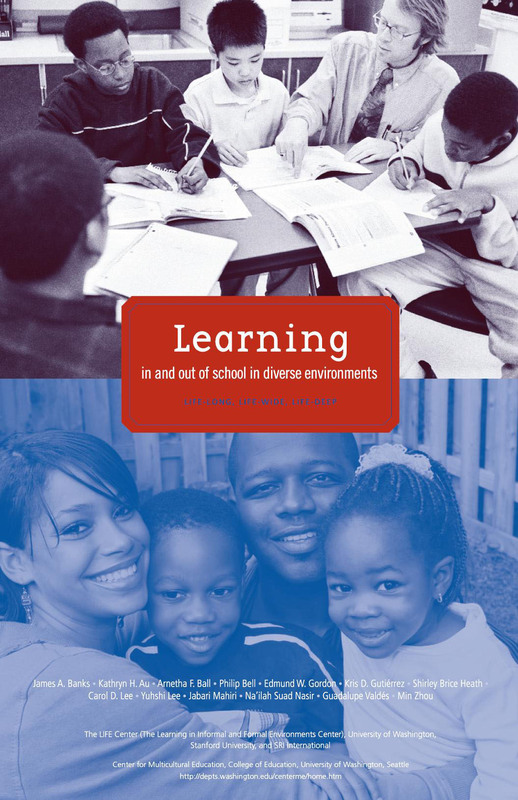 Click here to download a PDF version of Learning In and Out of School in Diverse Environments . (Please limit to downloading only one copy).